Tomorrow a Belgium door opens. 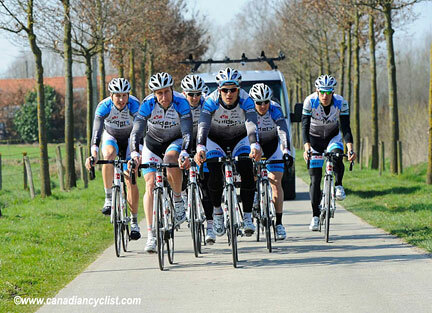 The 66th Dwars Door Vlaanderen will tantalize the riders with plenty of cobbles and steep climbs over 203 kms. An important warm up before grueling classics: E3 Harelbeke (Saturday), Ghent-Wevelgem (Sunday), Tour of Flanders (April 3rd). That said, the Canadian SpiderTech team will be there, and I believe ready to do battle. 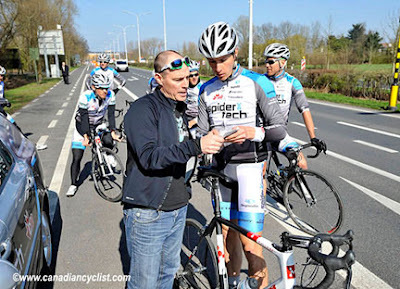 Svein Tuft will be leading the young spider squad working for the sprinters, Keven Lacombe and Martin Gilbert. The Canadian Pro Continental team is half way through their European education and they're producing very good results. The 3 days of West Flanders: Svein Tuft produced a solid 4th in the final TT. 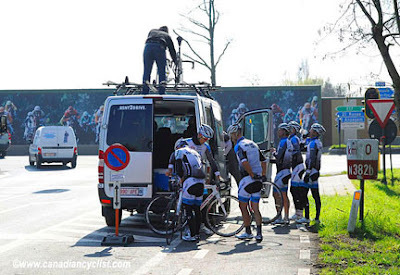 Nokere Koerse: Sprinter, Keven Lacombe in 8th place. Giro di Sardegna: David Boily winning the mountain classification green jersey. And for the young spiders ... cobble school begins tomorrow!